Hip dysplasia is the abnormal development of the hips. Puppies are born with normal hips, but some then develop abnormally resulting in a deformity of the hip joint. The deformed hip joint is less stable than a normal one, and later in life, arthritis develops as an attempt by the body to stabilise the joint. The hip joint is made up by the femur (thigh bone), and the pelvis. The femur joins the pelvis by a ball and socket arrangement, the socket formed by the pelvis, which surrounds the ball, or head of the femur. In a dysplastic joint, the head of the femur is incompletely encompassed by the pelvis, which results in a loose joint. This is called subluxation. The degree of deformity varies tremendously between affected dogs, but unfortunately, the degree of deformity does not correlate very closely with the symptoms that the affected dog displays. This first picture is an x-ray image of a dog with good hips. Note that more than 50% of the head of the femur is enclosed by the pelvis. This second picture is an x-ray image of a dog with marked hip dysplasia. Note how little of the femoral heads on both sides are covered by the pelvis. This is a much younger dog than that above. The black lines are where the bones are growing, and are normal. In young dogs the major symptoms are pain and lameness. The typical case is a large or giant breed dog, about 7 or 8 months old which resents being touched around the hind quarters. He may suddenly become reluctant to walk very far. Lameness affecting both hind legs is common, but it is more usual for the dog to swing its hind legs forward as it walks, resulting in a ‘wobble’ when watching the dog walking from behind. This can be quite subtle, and people are frequently unaware that the dog is not moving his hind legs properly. Other dogs walk or run with a ‘bunny hopping’ motion, where they are trying to move the hip joint as little as possible. Some dogs compensate for sore hips by shifting their weight forward onto their front legs, creating the false impression that the dog has a fore-limb problem. There may also be difficulty in rising from a lying position. Many cases of hip dysplasia go unnoticed as pups, and for many years the dog walks perfectly normally, (see Outlook below). Then, in later life, often not until 6 or more years of age, the dog develops a ‘stiffness’, especially on rising, which may go away after a few minutes. This is because arthritis has developed in the hip joint, and we now properly call this condition ‘hip arthritis’ rather than hip dysplasia. 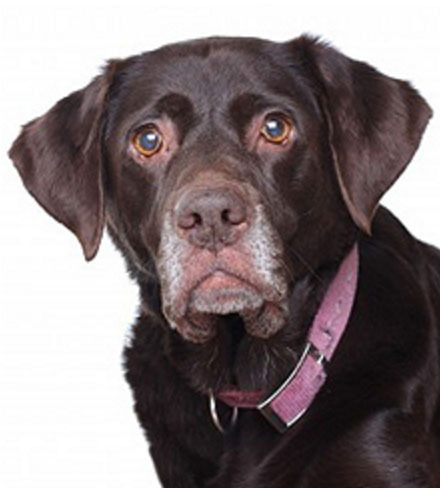 Hip arthritis is very common in older large breed dogs. The severity varies enormously between dogs. Some have only mild stiffness, which disappears within a few minutes in the morning. Others are severely lame, having difficulty walking for only even short distances. Most dogs fall somewhere between these extremes, but especially in the early stages, the usual presentation is a dog with a lameness which disappears on exercise. After resting, especially after heavy exercise, the lameness becomes much worse. Most people are familiar with the concept of an inherited disease, where one individual acquires a disease from a similarly affected parent. Hip dysplasia is an inherited disease. Unfortunately, it’s not that simple though. Not all dogs which are genetically affected by hip dysplasia actually go on to develop the disease. Secondly, not all dogs with hip dysplasia are actually lame, and many live perfectly normal lives despite the fact that they have dysplastic hips. This has important implications for breeding dogs, (see Prevention below). No-one is absolutely certain why a dog which has inherited hip dysplasia from its parents doesn’t actually go on to develop the disease. So we introduce another factor which we loosely call the dog’s “environment” to try and explain this. However, there are two significant things which do seem to play a part: diet and exercise. Diet – This is covered fully in the feeding section of the puppy pages. Basically “over nutrition”, especially of calcium, phosphorus and calories is believed to play a part. Most people with large breed puppies want it them to be big. That’s fine, but if large or giant breed dogs are pushed too hard, by overfeeding or by giving excessive mineral intake, then growth and development will not proceed correctly and hip dysplasia can result. Exercise – The abnormality in hip dysplasia is a loose joint. A pup that uses his loose joints a excessively, can result in the sensitive cartilage ends of the bones rubbing together abnormally, damaging them. This causes pain, and starts the process of arthritis, which is an attempt by the joint to stabilise itself. By restricting the amount of exercise that the puppy has, you can limit the development of hip dysplasia (see also Prevention below, and the exercise section of the puppy pages). Other environmental factors – There is little doubt that this is not the whole story, and that there are more, as yet undiscovered factors influencing the development of hip dysplasia. Not all dogs with hip dysplasia have parents with hip dysplasia. Just because a puppy’s parents have hip dysplasia, it is not inevitable that the puppy will develop hip dysplasia. There are many possible treatments for hip dysplasia. No one treatment is universally effective for all dogs. All the following have their merits, and problems. The single most important part of the management of dogs with hip dysplasia or arthritis is weight control. It’s a sad fact that many affected adult dogs are obese, often seriously obese. Simply reducing the dog’s weight to normal is sufficient in many mild to moderate cases to control all the dog’s symptoms without any need for medication or surgery. Fat dogs become much brighter and more active when they lose weight. At Vetrica we offer free help and support to allow you to achieve reliable and lasting weight control. Ask at reception for more details. Puppies, especially large and giant breeds, should have only light, regular exercise. (See the exercise section of the puppy pages for a full explanation). For adult dogs with hip arthritis, exercise is good, but too much is bad. Exercise stimulates blood supply to the joints, and encourages normal function. Too much exercise, even if the dog is not lame at the time will make the condition worse by damaging the joint further. Try to give your dog regular, light exercise, avoiding jumping, fetch or catch games if it has hip arthritis. On the whole these drugs belong to a family which we call NSAIDs (Non Steroidal Anti-Inflammatory Drugs, pronounced en-sayed). There are a myriad of these, but at Vetrica, we restrict routine use to a small range. Meloxicam (Metacam®). Meloxicam is a very effective pain killer. It has an excellent safety profile, rarely causes vomiting, and almost uniquely amongst the NSAIDs, actually improves the condition of an arthritic joint, rather than simply relieving pain. Because of this, with long term use, it is often possible to gradually reduce the dose. Meloxicam is safe to use during anaesthesia. This drug is presented differently from most NSAIDs in that it is available as a syrup, with it’s own dosing syringe. Practically, this means that the exact dose can be given to the dog, regardless of its weight. With tablets, this is not always possible as you are constrained by the size of the tablet, giving only a close approximation of the required dose. This is particularly useful in reducing the dose, as very small adjustments can be made. Meloxicam is currently the drug of first choice in the treatment of the pain of hip dysplasia and arthritis at Vetrica. Carprofen (Rimadyl®, Norocarp®). Carprofen is also a very effective pain killer, even for quite severe pain. It has a good safety profile, and like meloxicam, is safe to use during anaesthesia. It is available as two tablet sizes, 20mg and 50mg. It is safe to use long term, and side-effects are rare. The tablets are small and easy to administer. At Vetrica, carprofen is currently the second choice drug for the treatment of the pain of hip dysplasia and arthritis. Phenylbutazone (Many brand names). Phenylbutazone is cheap, and one of the oldest of the NSAIDs available. It occasionally causes vomiting, and should always be given with food to reduce its irritant effect. Its use in man is discouraged because it can cause serious blood disorders. It can cause blood formation problems in dogs, but not the serious ones that occur in man, and this side-effect is exceedingly rare. Studies in rats have shown phenylbutazone to increase the rate of development of arthritis. This means that although the dog looks better because he has been relieved of pain, this drug actually hastens the course of the disease. This is the opposite effect to that of meloxicam. Phenylbutazone is not in routine use at Vetrica. Aspirin – Aspirin is cheap and readily available, although unlicensed for use in dogs. While generally safe for use in dogs, and quite good as a painkiller, especially for mild pain, aspirin commonly causes vomiting, and all the drugs listed above have a much better safety profile. (Aspirin should not be given to cats except on specific veterinary advice). Ibuprofen (Nurofen®). NEVER GIVE THIS TO A DOG. Although it is one of the safest NSAIDs used in man, it is toxic to the kidney in the dog, at doses close to those used therapeutically. There is no reason to use ibuprofen in dogs. It is unlicensed, and there are safer and more effective drugs available. For a fuller description of NSAIDs, their effects, and the treatment of arthritis, go to the arthritis section. There are many of these licensed for use in animals, but only one for the dog in the UK, and that is pentosan polysulphate, (Cartrophen Vet® not to be confused with carprofen). This drug is given by injection at weekly intervals, usually on four separate occasions. The drug acts in many different ways, but basically serves to improve the environment in which the joint cartilage is in. It is the only class of drug in use to treat arthritis which relieves pain by actually improving the condition of the joint. The response is quite variable; in some dogs, no other treatment is required for many months; in others, there is no effect at all. Approximately 80% of dogs show a worthwhile improvement, but most of this improvement is not evident until the third or fourth injection, so just giving one injection to try it is not a suitable trial. The benefits of Cartrophen® are tremendous, especially in confirmed cases of arthritis (as opposed to just having a sore leg). It is virtually side-effect free. Dogs with certain types of cancer should not receive it though. • New Zealand Green Lipped Mussel extract. At Vetrica we have had good results with a product called Seraquin®, which in addition to glucosamine and chondroitin also has turmeric extract, which in a clinical trial was shown to have a beneficial effect in the treatment of arthritis. Pectineal Myectomy. This procedure is intended for the relief of acute pain in the young growing dog only. It has no effect on the development of arthritis in the hips later in life. The operation involves cutting the pectineus muscle, which runs along the inside of the thigh. This muscle’s action is to pull the legs inwards (adduction). Cutting it is believed to relieve tension on the fibrous capsule which surrounds the hip joint. Triple Pelvic Osteotomy. This procedure is designed to increase the amount of the head of the femur which is covered by the pelvis. The operation involves cutting the pelvis at three locations, and then repairing it with a specially prepared metal plate which rotates the socket part of the pelvis over the head of the femur. This is the job of an orthopaedic specialist. This treatment is indicated for the treatment of young growing dogs, which are destined for an athletic lifestyle (e.g. working sheepdogs, or gundogs). The results obtained by this procedure are generally excellent, but it does depend on the skill of the surgeon. It is probably not indicated for mildly affected pet dogs, because such a high proportion will get better anyway just with pain relief, (but see outlook below). Total Hip Replacement. As the name suggests, this involves replacing the dog’s hip joint with an artificial one. Both sides of the hip joint are replaced. The pelvic part is replaced with a cup shaped implant; the head of the femur with a metal ball which is cemented to the shaft of the femur. One of the biggest problems with hip replacement in man is that over time, the implant degrades, and itself needs replacing. Dogs don’t usually live long enough for this to occur, so only need it done once. About 20% of dogs don’t improve even after hip replacement. This is a specialist task, and is only indicated for heavy, adult dogs (weighing more than 25kg) that have moderate to severe pain which cannot be controlled with pain killers, diet and exercise control. This procedure is never undertaken lightly, and only if there are no other orthopaedic conditions of the hind limbs (e.g. arthritis of the hock [ankle] joint). Probably the biggest risk with this operation is that of infection. Very serious infections of the pelvis and femur are a real risk. Excision Arthroplasty This is a the removal of the head of the femur. The aim is for there to be no bony contact between the femur and the pelvis. Heavy fibrous tissue develops between the femur and pelvis after the operation forming a ‘false joint.’ Excellent results are obtained for all but the heaviest of dogs. If the dog weighs less than 25kg, there is no advantage to replacing the hip joint over excision arthroplasty. Following recovery, only an expert can detect any alteration to the way the dog walks. It is a relatively straightforward operation, and does not require referral to a specialist. 1. There are many dogs with hip dysplasia which show no symptoms. 2. Hip dysplasia is so common, that it could be argued that most dogs of most large breeds have hip dysplasia to varying degrees. The challenge then is not so much as to only breed from dogs that don’t have hip dysplasia, but to only breed from dogs which have markedly better hips than the average for the breed. That way, over time, hip dysplasia should become less common. This is achieved by x-raying a dog’s hip. The x-ray picture is scrutinised by an expert panel, various measurements being taken, and a hip score is arrived at. The scores are averaged for the breed, and from that we can determine whether or not to breed from any individual. To participate in the hip dysplasia scheme, dogs must be at least 12 months old, and be registered with the Kennel Club. The scheme is run by the British Veterinary Association in conjunction with the Kennel Club, who publish the hip score results for every dog, good or bad. If the parents were hip scored, their score will be printed on each puppy’s Kennel Club registration certificate. Hip dysplasia scores are explained in more detail, and a full list of breed averages are available on the HD Scores page. In general, the outlook is quite good. Most puppies with sore hips will get better as they get older, because the hips ‘tighten up.’ If the pup is destined for an athletic lifestyle, then a triple pelvic osteotomy is well worth considering, but if the pup is just going to be a pet, then pain relief as required is likely to be sufficient. A very small proportion of dogs will have serious problems. Some adult dogs have severe unrelenting pain, which doesn’t get better despite surgery. Most of the problems we see are due to obesity, or an inability or unwillingness of the owner to restrict the dog’s exercise, and it is these, sadly, that are euthanased due to treatment failure. Hip dysplasia is not a death sentence. The vast majority of dogs with hip dysplasia lead full and active lives, and if your dog has hip dysplasia, there is no reason why it cannot either.